I have a story to tell you. A sad story about a neglected bed. My Father-in-law lived in San Antonio for work for a year. He was packing up to move home the same week that we were moving from home to Austin. Because of the timing we inherited some things from his temporary apartment. One of those things was a full size bed. My son had just gotten new bedding for Christmas for a twin size bed, so the Full size bed went into the girls room by default. We thought we would be moving out of the rental house in a year, so I didn't buy new bedding. Once we moved into our house the bed would either go in a guest room or the boy would get it since he was the oldest. Two years later we are still in the rental house, it is still in the girls room, and until this weekend it still had never had new bedding. Poor bed. Poor sad bed. Better Homes and Gardens has a line of home related goodies that are exclusive to Walmart. I have one of their baskets in the kitchen that holds mail, I have some of their candlesticks on a bookshelf, one of their lamps on my desk, and a blanket on my bed. So when they contacted me and asked if I wanted to use some of the BHG products to make a room guest ready for less, I said yes-sir-e. And I knew just which bed was getting a makeover. So this sad story has a happy ending. A cute tufted comforter and a few decorative pillows later, the girls couldn't be happier with their new bed. I think the bed is happy too. And what would this post be without YOU being happy too! One of you will win a $100 Walmart gift card that you can use to make one of your beds happy and your room guest ready for less. So leave a comment letting me know what BHG Products you would like to have in your house and you will be entered to win! And last but not least, share a link to this giveaway on Facebook or Twitter for a third entry. The contest will run from today October 3, 2011 until midnight CST on Monday October 10, 2011. A winner will be selected at random from all entries and the winner will be contacted via email, so make sure to leave your contact information. I love the Better Homes and Gardens Ivory Scroll 16-Piece Dinnerware Set! I would love some pretty pillows to refresh my sofa or those mahogany pillar candle holders or some new lampshades (the taupe drum ones are lovely and only $11!) or some new pretty floral sheets...you get the picture! I actually used a BHG shower curtain to make new curtains for my remodeled kitchen. The fabric was perfect with my new colors! I'm liking the Antique Stripe Quilt. All I have to do is find matching sheets and pillowcases! So cute! I like the BHG Palm 3 Piece Towel Set for our bathroom and the BHG Paisley Jacquard Comforter Set for our bed. Thanks so much! I like you and BHG on Facebook (Amber H) and left them a wall post telling them you sent me! Some fresh towels would be nice or maybe throw pilloes. Vute stuff!! I would love new towels/shower curtain. I love thw Better Homes and Gardens Fleur De Lis Bedding Comforter Set. Wish the set you got came in gray!! Tagged ya in my post on BHG Facebook page!! I love the BHG stuff at walmart and also love your blog. I find so many cute ideas on here and visit every day. I would get some new patio cushions for the spring. Oh, definitely new bedding too. We're using a hand-me-down comforter from my early college, pre-husband (and pre-dating husband!) years. And it's white, so you can imagine that it's a little dingyish. We also have no nice pillows.... Gah! The damask bed set is lovely! And curtains in the room would be nice since the sun does rise on the guest side of the house. Curtains and matching bedspread would be much appreaciated! I'm really, really ready to re-do our bedroom so some new bedding would be great! I would love to get some of their dishes. My dishes are of a few varieties and don't match (white plates, random cups, patterned plates, etc) and the red Simply Fluted dish set is pretty and so is the white Ivory Scroll set. I love the Better Homes and Gardens Bedding and pillows! Commented on the BHG Live Better FB page. 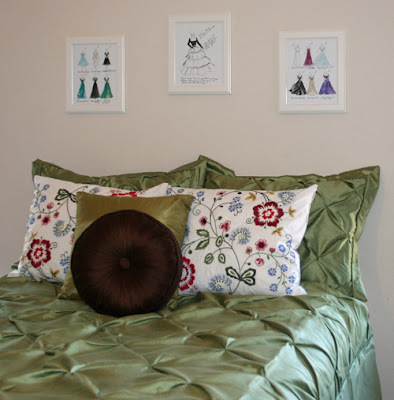 I'd love to have the BHG Bedding Tufted 4-Piece Comforter Set in Organic Green and the Red Currant Sheet Set! I like you and BHG on Facebook (ID: Lynda Castillo) and left them a wall post telling them you sent me! With the holidays coming up, and all the cooking that will ensue, I would love to have the Better Homes and Gardens Forged Cutlery Block set. I love that it has a piece of sharpening steel on it, and includes kitchen shears. And, it is really classy looking :) There is nothing worse than trying to use a knife that isn't that great when chopping, etc. Those knives would be a great help! I am in need of about one million throw pillows right now. One. Million. Throw. Pillows. Sprucin up the old hand-me-down-couches. I really like their all over ruffle pillows..they'd be perfect for our master bedroom. Thanks for the chance to win! I love the garden antique striped bedding set. This would look so nice in my guest bedroom, along with a set of matching curtains. Maybe I could finally spruce up that room instead of using it for storage! I would use it to get "accessories" for the room! I would love a BHG comforter for my daughter's bedroom. She is not a little girl anymore and needs something more her style. I'd love to have the Better Homes and Gardens Ashwood Road Chest, Cherry. I had some BHG curtains in my living room and love them SO much I want to get some for my bedroom as well! Thanks! I would love to have a new bedding set for my bedroom. I am using a comforter now, that I bought on clearance 5 years ago! It's so ugly!! Thanks for the chance to win! I would love a new comforter or duvet cover for my bed. The one I have now is hot pink and UGLY! Thanks for the chance to win! Thanks for the giveaway! I could really go for the BHG stainless steel roasting pan in time for Thanksgiving!! I liked BHG on FB and tagged you in a comment on their wall! I've really been wanting one if their slip covered chairs for awhile now. Oooh-bedding!! bedding bedding bedding. :) Mine is looking less than par for sure and I LOVE some of their designs! Thanks BHG!! BHG has so many cute throw pillows that would look great in our spare room! I thanked BHG on their FB page! I'm having a linky party for giveaways. I'd love it if you wanted to stop by and enter to promote your giveaway! Oh to have only one need in the house. We just got a new sofa that totally changes the look of the living room but I really want to redo the master bed.. The comforter and curtains and pillows all need to be replaced.. SUCH cute bedding Lorie! Love the after shot, and the prints on the wall! I actually love Better Homes & Garden's scented candles. The large jar at Walmart is only $4.97! I am burning Spiced Pumpkin Pie as we speak! Love their BH&G Linen Tower- I desperately need one! I am SO IN LOVE with Better Homes and Gardens Damask Scroll 8-Piece Bed in a Bag!!!!! I have been wanting to re-do our Master bedroom for sometime now, but just haven't had the extra money and time to do and this would be the PERFECT opportunity!!! I would love to get curtain rods & curtains for our windows! right now we just have those ugly slatted blinds that came with the place (it's a rental). The 'Better Homes and Gardens Flourish Double Rod, Bronze Finish' rods are really great looking! Liked BHG on Facebook & tagged you in the comment. Thanks for the chances to win! I really like the citrus scroll decorative pillows - they'd be perfect for our living room! Thanks for the chance! Your bed turned out so pretty. I really had a hard time deciding which things I like best because BH&G really has a great variety of beautiful products. We've been talking about doing a makeover for our bed too so I looked and found the Elegance coverlet. I love it! It's so pretty, yet simple. Just my style. My master bedroom needs a lot of work. There are so many cute things to choose from. Or maybe I would buy the Better Homes and Gardens Garden Grove 4-Piece Conversation Set for my patio. I would love a bed spread or some curtains from BHG. I am in the middle of redoing the master bedroom and that would be perfect! oooo, I'm in need of new bedding too. I like the 5 Shelf bookcase. I'd love the Better Homes and Gardens 13-Piece Hard-Anodized Cookware Set! I love the BHG serving ware! So simple, and so pretty! I need new lamps for my living room! They have a 4 pc lamp set, that would be perfect!!! This is a Great Giveaway!! Thanks for a chance to win!! I left a comment on the BHG Live Better Facebook Page and tagged Be Different, Act Normal in the post!!!! I would like to get the Better Homes and Gardens 5 Piece Pedestal Dining Set, Black Finish . Liked BHG on fb and thanked them for the giveaway here. I'd love the Better Homes and Gardens Bath Towels, Damask and the coordinating Damask shower curtain. My towels look like rags and they're ORANGE..nothing in my bathroom is orange and I can't believe I bought these so many years ago; what was I thinking? I would love to redecorate my tiny, tiny bathroom. I love how BHG has everything that matches and I don't have to try to match towels, shower curtains, and other items. I'm a decorating mess and I like that they do the work for me! And I left a message on their Facebook page with your link, too. Thanks for letting me know it was there! Can't believe I didn't like you on Facebook before. Glad you set up that link, too! So many beautiful items from BHG and at great Wal Mart prices - who could resist? Love the Better Homes and Gardens Flourish Curtain Rod for starters! The BHG white Ivory Scroll dish set looks nice, I'd have that. I want some of their cute dishes! The quatrafoil towels are awesome! i would love a few sets of those. I really like the Better Homes and Gardens Pembroke Matelasse Coverlet! 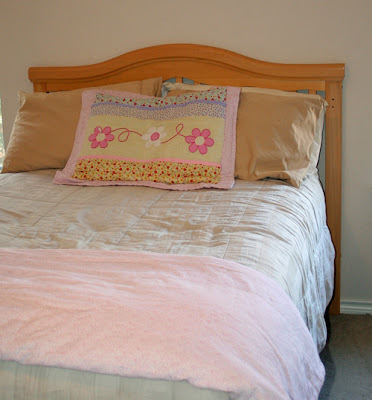 The tuffted comforter is just darling! I also love the Baylee Quilt set! I would love a cute comforter and home decor items... they have such cute stuff! I really need some of those adorable throw pillows. I also really like their bookcases. Oh, i really like the BHG 5 pc pedestal dining set!!! i love their farmhouse table, which we now own---but i want to get the matching bench! i like them on fb and tagged you in sending me! So hard to choose just one thing but love the west ridge black buffet! Wrote on BHG's FB page and tagged Be Different in it. 4 piece Tufted Bedding in Aquifer would be beautiful in my room! Very cute and a great price too! I didn't realize that BH&G had products at Walmart. We could really use an official TV stand - instead of a stand-in coffee table. I like the Willow Mountain one. I love their candles and their baskets! Awesome giveaway! I am so in need of some new pots and pans, so I would put it towards their stainless steel cookware set. I liked BHG on facebook! I have no idea what I would buy! There are so many possibilities! My fav B&G products are All-Over Ruffles pillow, Floral Damask Rug, Pretty Peony Accent Rug. Hands down, I would love new bedding for my room. I am always the last one to get something new(we have 4 little boys :-)). Thanks for the chance! I really like BHG bedding and pillows. I headed over to FB for both BHG and your blog. I couldn't tag your account but I left a comment. I would love the Better Homes and Gardens Arbor Rose 12 piece Bed in a Bag for our room, our current bedding is a hand-me-down from my SIL. Thanks! Love! I'd take advantage of some of their home accessories...lamps, frames, etc. I love the Country Scroll dinnerware!